Mike's Carpets building: Start date pushed back to September | West Leeds Dispatch | News. Views. Get involved! Renovation work on the landmark former Mike’s Carpets building is due to start in early September – two months later than expected. As reported by the Dispatch back in May, work to restore the building, off Stanningley Road, was due to restart in July – but the date has now been pushed back. 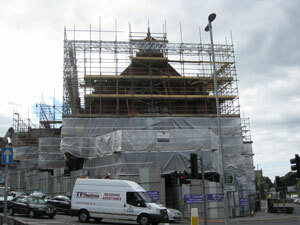 Former Mikes Carpets building before the scaffolding came down in April. Negotiations about the restoration work have been ongoing between the site owner, architect and new contractor on the Leeds City Council-managed scheme. The work is the centrepiece of the wider Armley Townscape Heritage Initiative project to improve the area and is funded by £500,000 of Heritage Lottery money and £150,000 from the building’s owner, businessman Mike Smith. Work on the renovation of the Grade II Listed building was delayed in early April after the initial builders left the project, with no major work completed. Scaffolding already erected for the job was taken down. All lottery money for the Armley Townscape Heritage Initiative Scheme must be spent by next March, or be returned to the Heritage Lottery Fund. The spokesman added: “It is anticipated that erection of scaffolding on site and a start to the works will take place in early September. “The project will repair the natural slate roof, restore traditional windows and panel doors and reinstate the boundary wall along Branch Road and Stanningley Road. Local residents attending an Armley Forum meeting back in May were warned that the Branch Road project was on a knife-edge and could ill-afford any further slippage.